Out-of-home advertising may still have a relatively low share of overall advertising budgets, but it will expand at multiples over the rest of the so-called "traditional" media marketplace over the next five years, according to a report released today by IPG Mediabrands' Rapport and Magna units. “Out-of-home is the last advertising format that consumers can’t skip or block, and still reaching the young urban active," Magna Executive Vice President-Global Market Intelligence Vincent Letang notes in the report, adding: "Combined with huge progress in campaign management, audience measurement and attribution, this explains why OOH advertising has grown steadily in the last ten years and will continue to grow, by 3% per year globally, in the next five years. Out-of-home -- which expanded 4.1% over the past 10 years -- is on track to expand 2.8% over the next five, according to the Interpublic estimates. 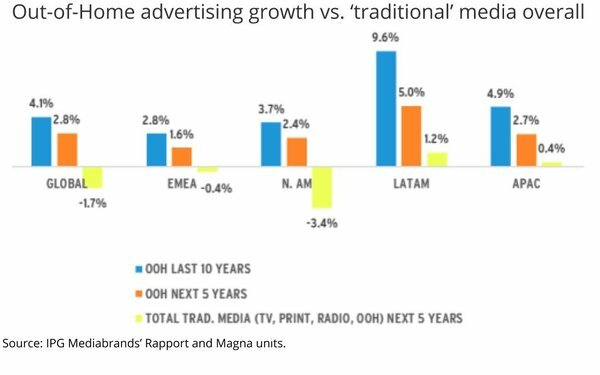 While that may seem tepid, it compares with a contraction of 1.7% for the overall "traditional" media marketplace over the next five years. Magna estimates that out-of-home currently has about a 10% share of ad spending. 1 comment about "IPG Units Project Out-of-Home Only 'Traditional' Medium To Expand Over Next 5 Years". Erik Bottema from Rouge Media Group, January 31, 2019 at 9:21 a.m.
10% of overall spend seems a bit ambitious?